Château Lafite-Rothschild can be the most enigmatic of the Pauillac first growths. Certain vintages, like 2009 and 2010, are knockout from the off. But some vintages are not easy to judge young. Lafite 2015, was reticent when I tasted it in April. It exhibited elegance and composure for sure, but it was far less assertive in comparison with wines from other top properties tasted on the same day. Lafite has received glowing reviews elsewhere, I should point out, so you might wish to flag my notes as outsider scores. 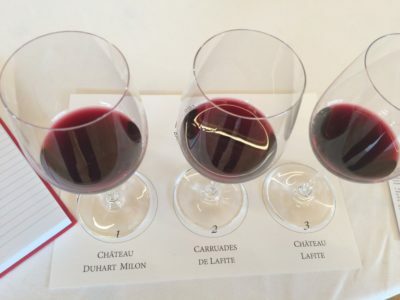 I also found the samples of Carruades and Château Duhart Milon elegant and lacking concentration. I’d expect all these samples to gain weight during elévage, but let’s just say they were the least expressive wines among Pauillac‘s top tier that I tasted. To be fair on the day I tasted at Château Lafite-Rothschild, I arrived just as a rain storm was brewing. So a substantial drop in barometric pressure might be to blame for my rather low scores, who knows. I certainly plan to re-taste these wines down the track. The 2015 vintage was the first for the Lafite stable with Eric Kohler at the helm. The formidable Charles Chevallier stood down as Technical Director late last year, although he still works for as a senior advisor at Lafite and for the other properties in the Domaines Baron de Rothschild portfolio. There is no doubting the aromatic profile of the sample of Lafite I tried. It had that tell tale cool blackcurrant and lead pencil nose. Still it was far less effusive or concentrated overall than in the recent great years here. The palate was measured and composed with a positive thread of acidity. It’s decent stuff, don’t get me wrong, but it didn’t set the pulse racing. Hopefully it will put on further weight in barrel and fill out. For me at this stage it is trumped by 2014 I reckon. Time will tell. Carruades had more obvious flesh, reflecting the greater Merlot in the blend, but the palate felt sappy and a little pinched. Duhart exhibited Pauillac personality with blackcurrant and graphite tones, but the palate was also somewhat subdued. It felt a little tight and awkward at this stage. I’d imagine that both wines will fill out, just as I expect Lafite will. Still for me they emphasised the degree to which 2015 is a fickle vintage on the right bank, with some samples impressing, others disappointing. The following notes were taken at Château Lafite-Rothschild on Monday, 4th April, 2016.